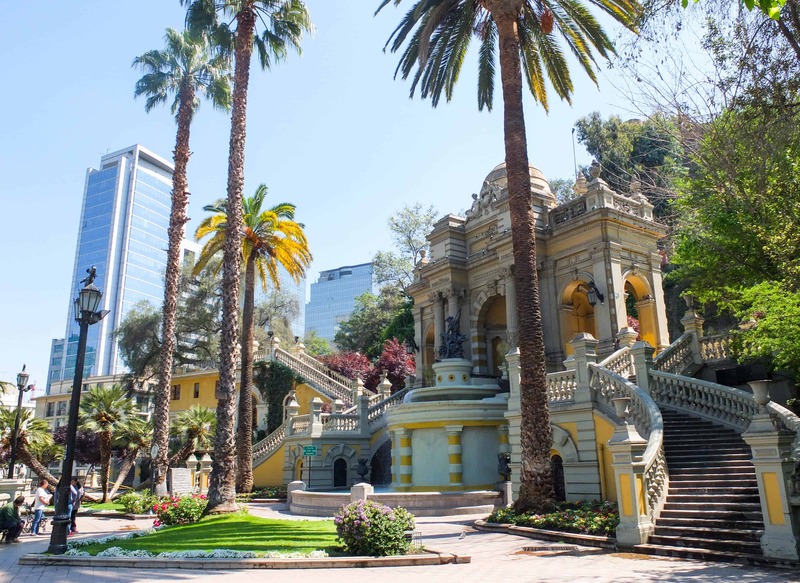 The gardens and lookouts on Cerro Santa Lucía make a great introduction to the Chilean capital. 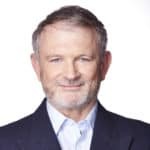 Bernard O’Shea gets acquainted. 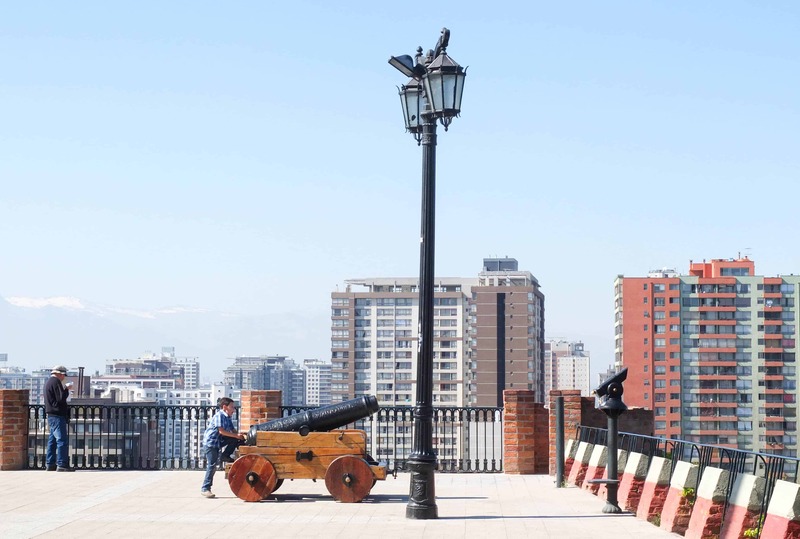 “The first thing you should do in Santiago,” my Chilean friend said, “is go for a walk up Santa Lucía hill. 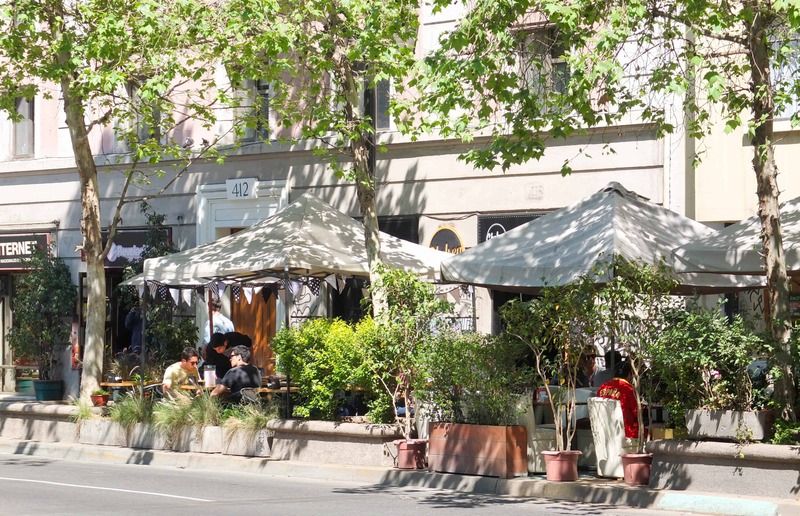 It’s beautiful and there’s a lookout at the top which will give you a good feel for the city.” So early on a sunny Sunday morning, on my first full day in the Chilean capital, I set off in search of Santa Lucía. 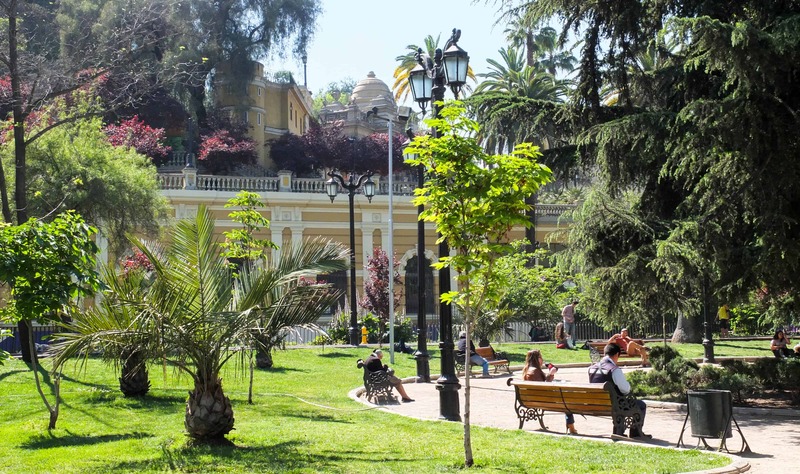 The teardrop-shaped cerro (hill) is conveniently central; its southern part adjoins the main thoroughfare of the city, Avenida Libertador Bernardo O’Higgins. 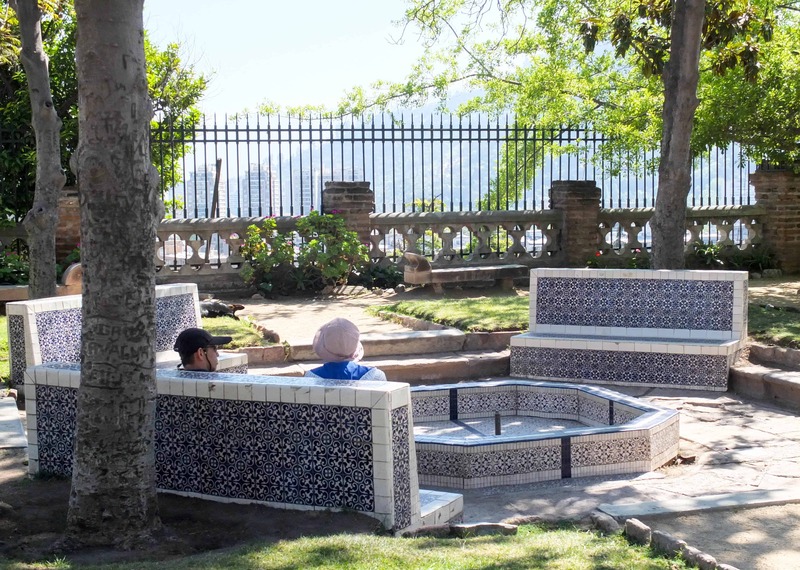 If you approach from the west, you’ll first come to a pleasant little park (below) – Plaza Benjamín Vicuña Mackenna, named after a former mayor of Santiago whose mausoleum is up on the cerro. It was his idea to turn the hill into a pleasant garden for the people. 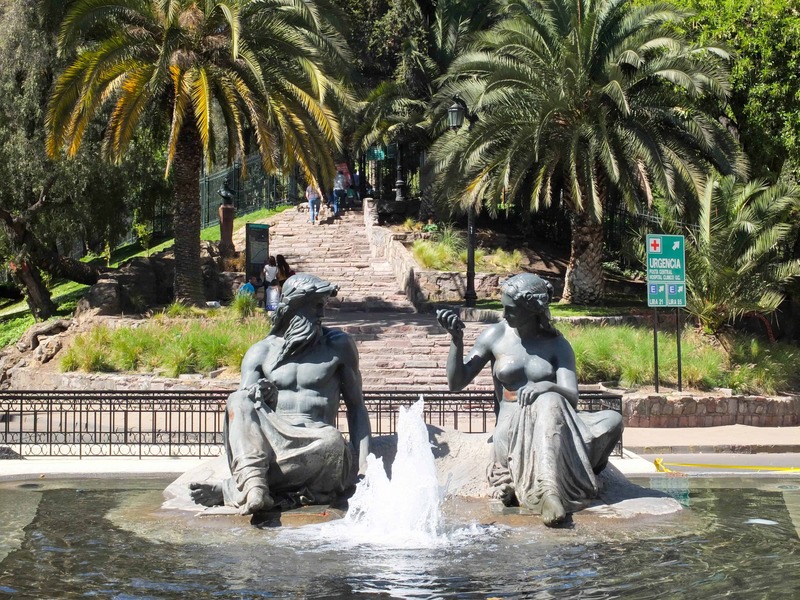 Beyond the plaza is one of a number of pedestrian entry points to Cerro Santa Lucía, but this one is most certainly the grandest as it brings you to the gorgeous Fuente Neptuno, or Neptune’s Fountain (pictured at the top of the post). Spend time here having a good look around because it’s a really picturesque complex, and there’s a little crafts shop inside. From here you can start climbing the cerro, pausing to enjoy the views from the various lookouts along the way. It’s about 70 metres up to the top. The hill was always of strategic significance, and in the early 1800s two forts were built here, one of which is still standing. In various parts of the ground, you will come across the odd cannon on display. Since then, of course, office and apartment blocks have encroached and spoiled the views, but up here you feel like you are having a pleasant respite from city life. On the very left of the photo above you can just make out the snow-capped peaks of the distant Andes mountains, whose presence is a reminder that nature still rules the roost in certain parts. There is a odd mish-mash of statues scattered about the park: priestly and saintly ones (presumably Santa Lucía is one – the hill got its name from a victory in battle on her saint’s day), conquistadors, a dog sitting attentively, nymphs carrying vases and a little cherub baring his buttocks. I like the one of a native Indian chief or warrior high up on a crag (above). Friendly faces along the way. 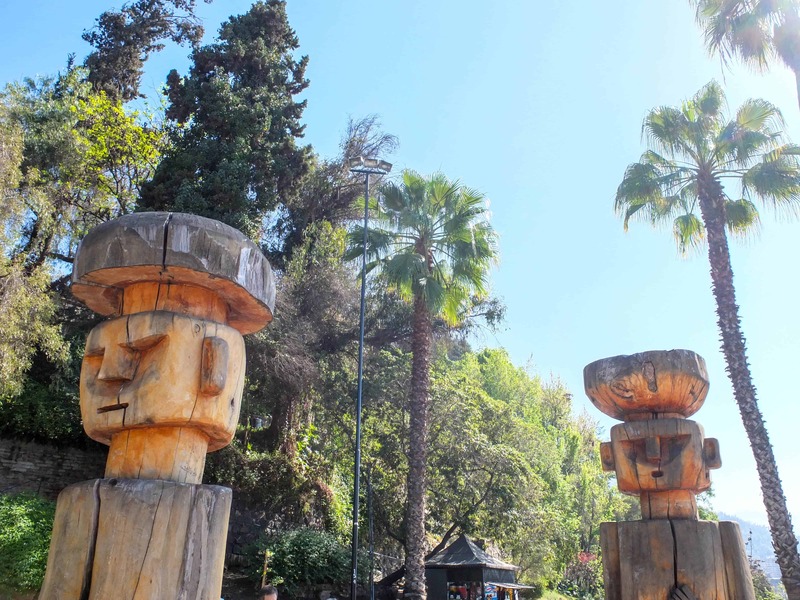 Another interesting tribal touch was this pair of wooden totems under the palm trees. 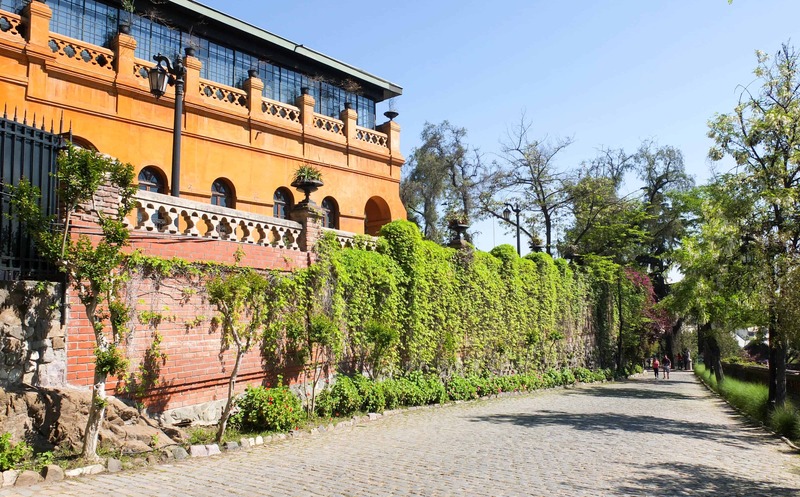 The old fort, Castillo Hidalgo, has been converted into a restaurant and functions venue and decked out in a coat of mustard coloured paint. On this Sunday morning, though, just when I needed it most (my rumbling, grumbling stomach was producing cannon fire of its own) it was shut. Another vista with the Andes mountains beyond. 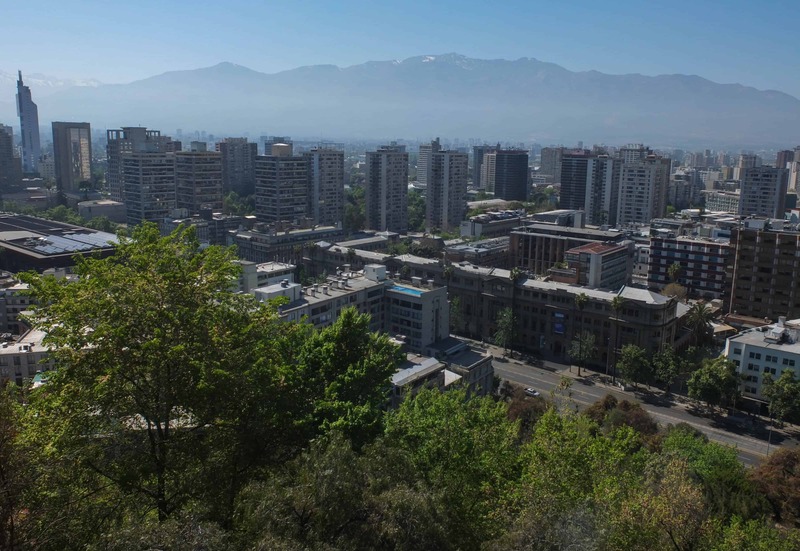 On first inspection, Santiago is not the most striking city in the Americas – the distant mountains always seem obscured by a haze of pollution – but once you get to know it better (I had a week to explore), it grows on you. 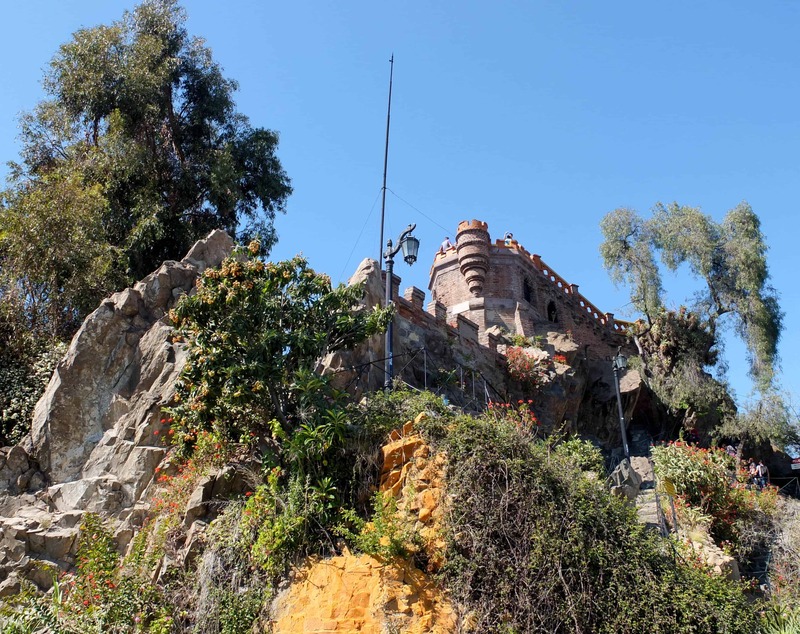 The city does have big belts of greenery, most notably the enormous Cerro San Cristobal, but the beauty of Cerro Santa Lucía is that it’s compact and easily explored in an hour or so. Most of the more spacious terraces are midway up the hill; the peak is more of a crag, and if you want the best views you will have to mount the narrow stairs to the tower on the top. If you can get to that tower, you’ll be king of the hill. Spare a thought for the labourers who had to bring up the bricks. 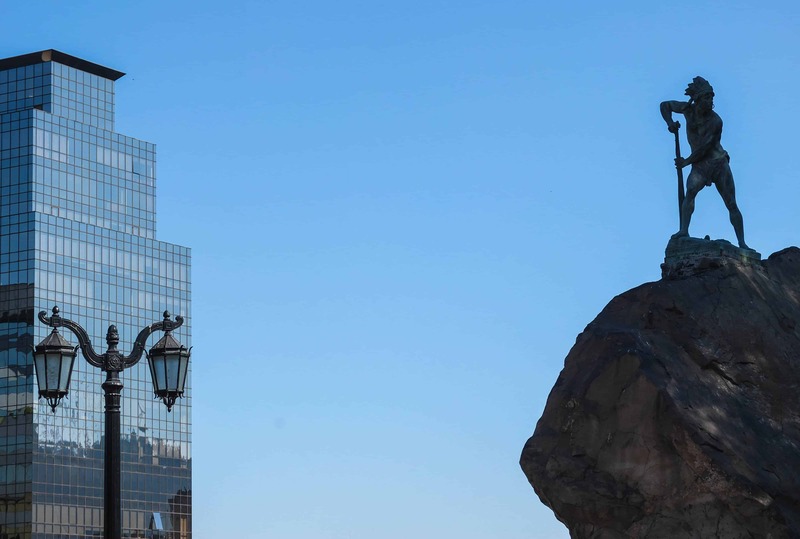 The northern tip of the park, the pointy end of the teardrop, is where you want to exit, for the streets here are much quieter on than on the Avenida Libertador Bernardo O’Higgins. There is even a bubbling fountain at the intersection. 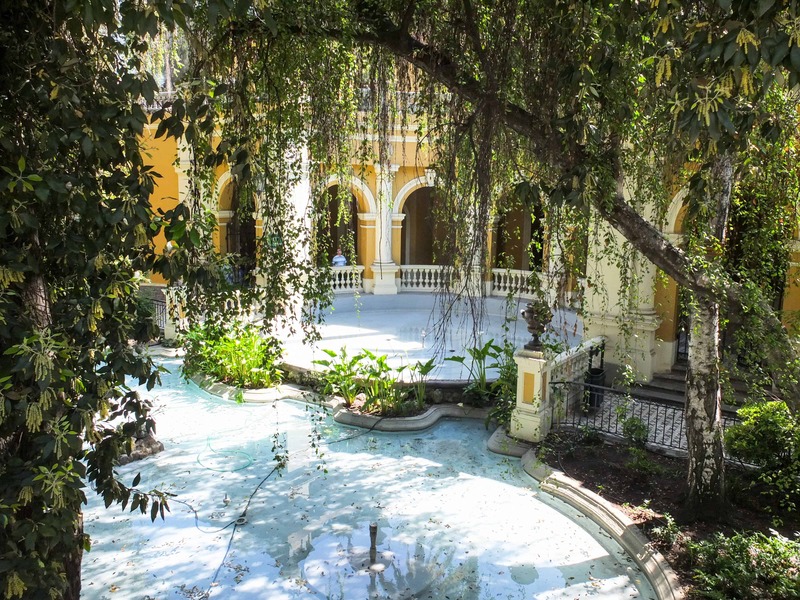 Wander around Valparaíso, the coastal city that dazzles.